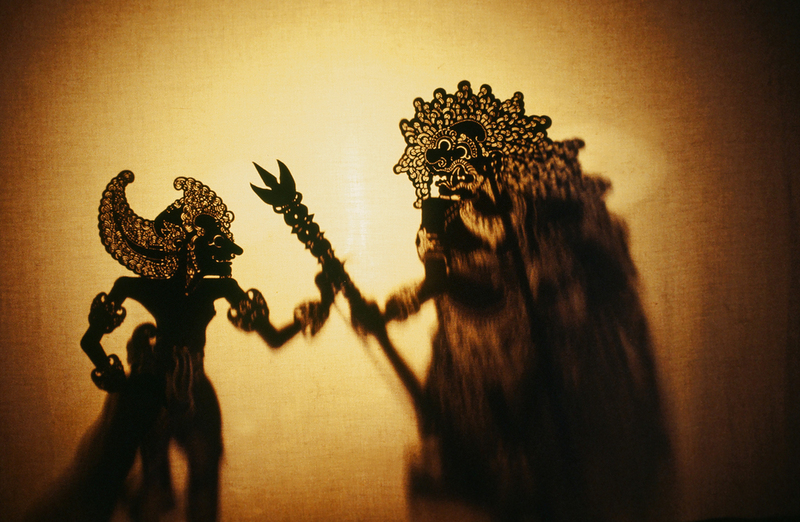 Wayang Bali, the Balinese Shadow Play, is one of the most revered traditional art forms in the world. According to Balinese philosophy, a wayang performance is a symbol of the cosmos. The dalang (Shadow Master) represents God; the screen represents the world, including the atmosphere; the damar (oil lamp) is the sun and the banana log underneath the screen is the earth on which the creatures walk; the wayangs (puppet characters) are the creatures. The accompanying gender music represents irama djaman, which means in phase with the periods of history. 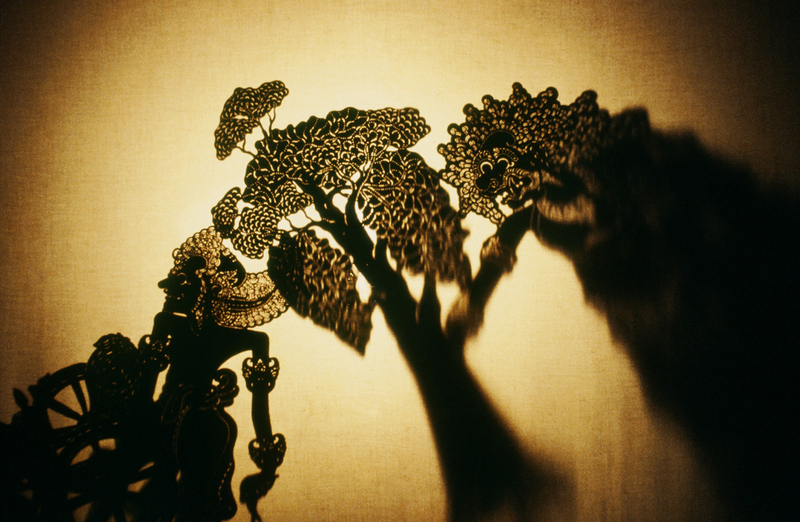 Plots for the shadow play are drawn from the Mahabharata myth cycle. Five brothers are pitted against one hundred jealous cousins in a struggle for power involving gods, demons, magical weapons, and the inevitable beautiful princess. 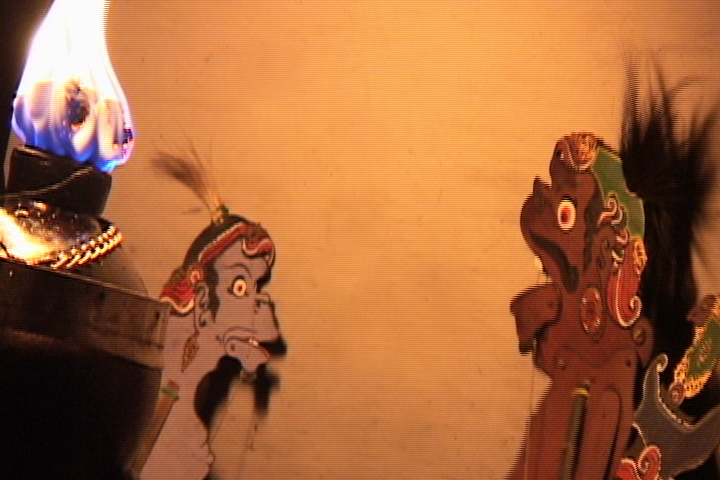 Wayang Bali takes place in two languages simultaneously: the ancient language and the language of the audience. 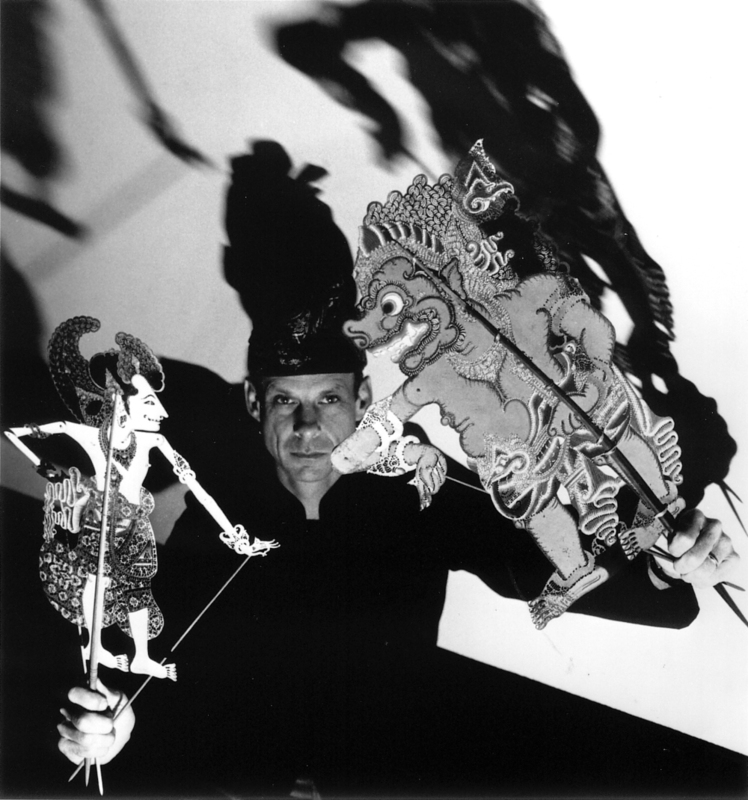 Larry Reed is able to perform wayang in English, French, Spanish, German, and Indonesian, making it possible for the Western audience to appreciate the ancient art form. Visit our blog to learn more about Larry's journey to Bali and Beyond. Carla Fabrizio began her study of Indonesian music at Mills College under the direction of Lou Harrison and K.R.T. Wasitodipuro. On a Fulbright scholarship, she studied rebab (Balinese spike fiddle) with I Madé Lemping, the leader of one of the foremost gambuh dance drama troupes in Bali. Since then, her primary musical interest has been performing and teaching Balinese music (with Gamelan Sekar Jaya since 1983, ShadowLight since 1990, and Gadung Kasturi since 1997). She has acted as music coordinator in several collaborative contemporary projects, including ShadowLight’s A (Balinese) Tempest, Clubfoot Orchestra’s and Gamelan Sekar Jaya’s Legong: Dance of the Virgins, and The Residents’ Wormwood: Curious Stories from the Bible. Lisa Gold, PhD (1998 UC Berkeley) has been a member of ShadowLight since 1983 (when it was called Shadow Play Theater Co.). She lectures at UC Berkeley and has research interests in Balinese and Javanese music in ritual & theater, wayang and gender wayang, oral performance and improvisation, sound studies, music, place and spatial orientation, transmission, performance eco-systems, and folklore and folk music of the British Isles. A member of Gamelan Sari Raras, Sekar Jaya, and ShadowLight Productions, she is the author of the book Music in Bali: Experiencing Music, Expressing Culture, (2005), the “Bali” article in the New Grove Dictionary of Music and Musicians, and a chapter in Performing Arts in Postmodern Bali – Changing Interpretations, Founding Traditions (2013), and an article in the Smithsonian Performing Indonesia on-line publication. Sarah Willner has studied and performed the music of Bali since 1988, with Bay area's Gamelan Sekar Jaya in the U.S. and with many teachers in Bali, including I Wayan Loceng, I Wayan Konolon, I Made Subandi, I Wayan Wija, and I Nenggah Marta, legendary specialists in gender wayang (music of shadow theater). She has performed with and managed ShadowLight Productions’ large-scale shadow theater works (In Xanadu, Sidha Karya, Kawit Legong, and Ambrosia of Immortality) at numerous venues, including twice at the Jim Henson International Puppetry Festival at the Public theater in NYC and the Spoleto Festival, UCB’s Zellerbach Hall, UCLA’s Royce Theater, and many other venues in the US. Currently a member of the Lightbulb Ensemble, she has performed recently with the JACK string quartet at the Smithsonian, Disney Hall, and other venues. As a violist and violinist, she prefers to play the wild and wonderful music of local composers and friends. Watching the action played out by the shadowy imagery builds a new appreciation for puppetry. ...a perfect introduction to this ancient form of entertainment. The way his warriors and demons dance about suggests animation or robotics rather than pupetry.